If you were at my home in January listening to the wonderful Sarah Sample, then you already know what a special treat it is to hear her sing live. 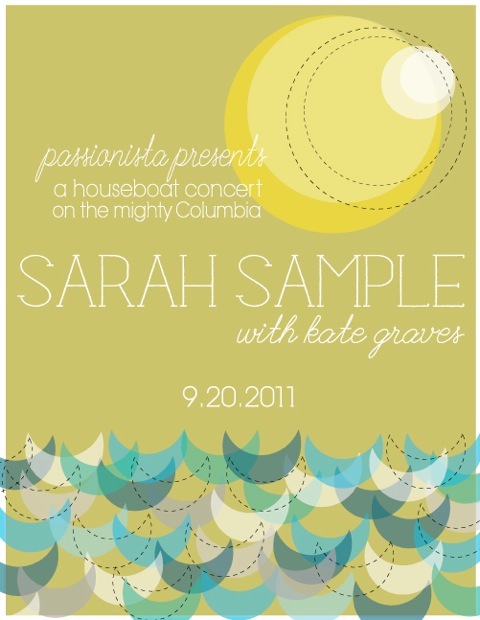 This show will be even more of a treat because we will listen to Sarah on a houseboat, floating the mighty Columbia River as the sun sets on a warm September evening. The evening will begin at 6:30pm with a social hour where we invite you to board the beautiful houseboat, mingle with other concert guests, and enjoy delicious refreshments. The boat will launch promptly at 7:30 and the show will begin at 7:45. Mark your calendars, and don't miss what promises to be an enchanting evening of music on the water. **Special thanks to my talented friend Lindsay for the beautiful concert artwork.